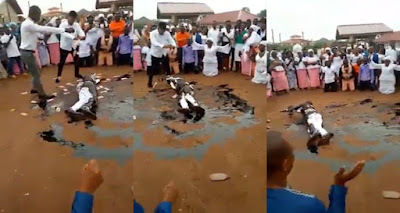 David Amoh, a Facebook user has taken to his timeline to share a worrisome video of a Ghanaian pastor rolling in engine oil while he is sprayed money. Identified as the leader of Blessing of the Christ Faith Overcomers Chapel, he was caught on camera rolling about on the ground which was covered with engine oil while he is clad in white during a recent church programme in Accra, Ghana. As he rolls about, his church members are seen singing and clapping as they gather round him. At one point, two young men came forward to spray some amount of money on the pastor while he continued to roll on the ground. The pastor later stood up and prayed for the members. The very reason why he decided to roll about in the engine oil is not entirely clear at the moment.